Coverage at Gizmodo. Sounds like ISO expansion goes up to 3,000,000 or so. It'll be interesting to see how things look at 100,000-400,000 where the A7s series currently break down. Today, Nikon Inc. announced the latest in the acclaimed series of flagship FX-format professional DSLR cameras, the Nikon D5. 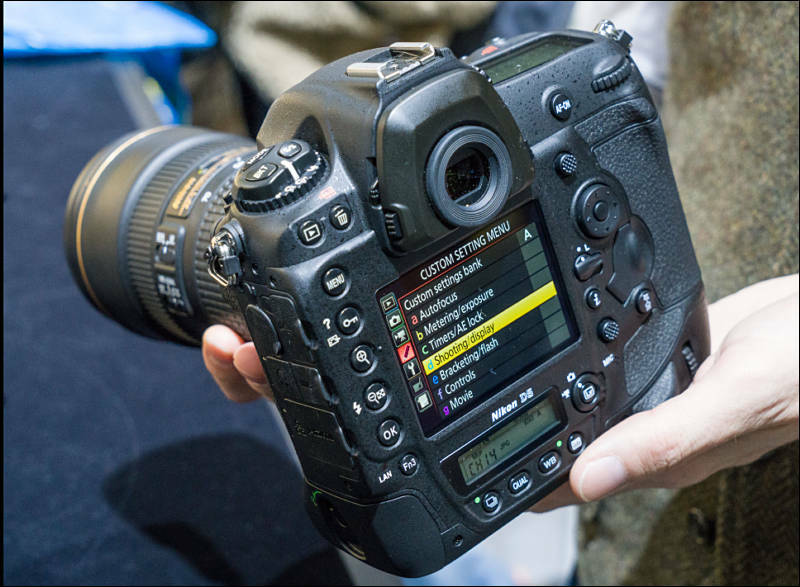 Far surpassing mere evolution, the D5 boasts a myriad of powerful new imaging innovations, including a Nikon-developed 20.8-megapixel CMOS sensor, an all-new 153-point AF system, 4K UHD video capture and EXPEED 5 image processing to give photographers the best balance of performance, precision and low-light ability. Nikon has also announced additional products, including the WT-6A Wireless Transmitter and the exciting new SB-5000 Speedlight, Nikon’s first radio frequency (RF) controlled flash. Astounding Low-Light Performance - The Nikon D5 offers an unprecedented native ISO range, from 100 to 102,400, reinforcing the D-series reputation as the leader of low-light image capture. A veritable new world of shooting opportunities awaits, as advancements in noise reduction and processing help capture low-noise images with fantastic fidelity that were previously impossible. The D5 tames the shadows, whether shooting a newlywed couple’s candle-lit first dance or sports with minimal lighting. The D5 also realizes unprecedented image quality in the high-sensitivity range between ISO 3200 and 12800 — the range favored by sports photographers. In addition, the D5 affords the ability to use higher shutter speeds with minimal illumination, letting photographers capture stunning images that are sharper, clearer and more colorful than ever before. As an added benefit, the next generation autofocus system performs in near darkness, acquiring focus in as little as EV-4 illumination. For extreme low-light ability, the ISO range is expandable from 50 (Lo-1) to a staggering ISO 3,280,000 (Hi-5), offering near-night vision capability that’s well beyond the visibility of the human eye. This extreme sensitivity is a benefit to photojournalists as well as for surveillance and security applications, letting users get shots others cannot see without a flash. This vast ISO range is also available to those capturing 4K UHD video, opening up new possibilities for multimedia and spot-news capture. Exhilarating Image Quality - The Nikon D5 delivers on the promise of stunning image quality with the adoption of a new, Nikon-developed 20.8-megapixel FX-format CMOS sensor. The camera is designed to achieve the optimized balance between the large full-frame sensor size, resolution and the new EXPEED 5 image processing engine. Users can be confident that images will have enhanced sharpness and clarity, faithful skin tones and the unequaled dynamic range that Nikon pros have come to love. 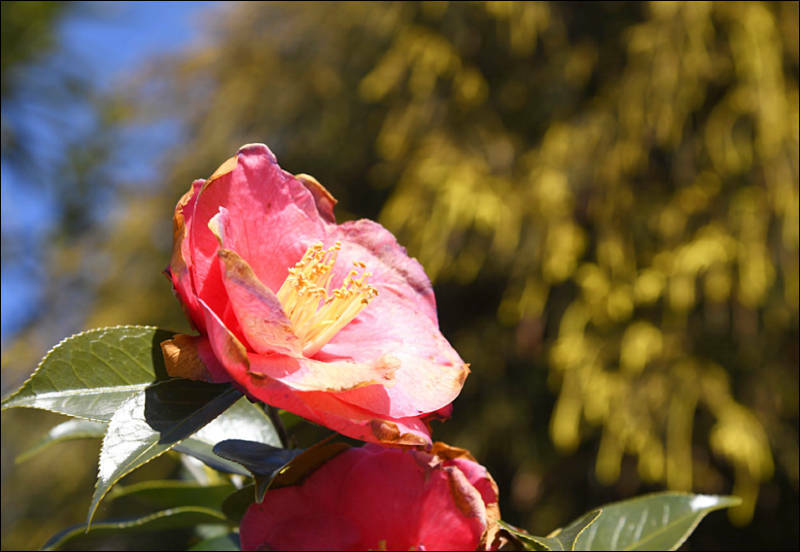 EXPEED 5 also helps to enhance noise reduction, letting photographers take full advantage of the D5’s immense ISO range. When paired with legendary NIKKOR optics, the D5 is truly a tool to help photographers capture the sharpest images possible with astounding clarity and radiant colors. Fast Acquisition, with Precision – An exciting addition to the D5 is an all-new AF system with Nikon’s first dedicated AF processor. The Multi-CAM 20K AF sensor module offers superior AF performance with 153 AF points, including 99 cross-type sensors - triple the AF points from Nikon’s previous flagship, the D4S. Of these 153 points, 55 AF points/35 cross-type points are selectable by photographers to quickly and easily frame any shot. The system is configurable in 153, 72 and 25-point coverage when used with Continuous AF, allowing for stellar AF tracking performance of even the most rapidly moving subjects throughout the frame. Fifteen of the AF points are also functional up to f/8, further aiding those who require extreme telephoto capabilities, including wildlife photographers. This all-new AF system is coupled with a new 180K pixel RGB metering system and Advanced Scene Recognition System, helping to achieve optimally balanced exposures and accurate white balance in even the most challenging light. Rapid and Flexible Workflow - Further enhancing speed, the D5 is able to utilize the superior read and write speed of XQD memory cards, which are up to 35% faster than CF cards. To appeal to a wide variety of photographers, the D5 will be available in two versions; with either dual XQD card slots or with dual CF card capability. For maximum efficiency the camera is also capable of shooting smaller RAW Size S or M file types (12-bit, uncompressed), for greater flexibility when transferring batches of files from the field, while retaining image integrity. Photographers can also use the built in 1000 Base-T 400MBps Ethernet connection for image transfer, with speeds up to 1.5x faster than D4S. 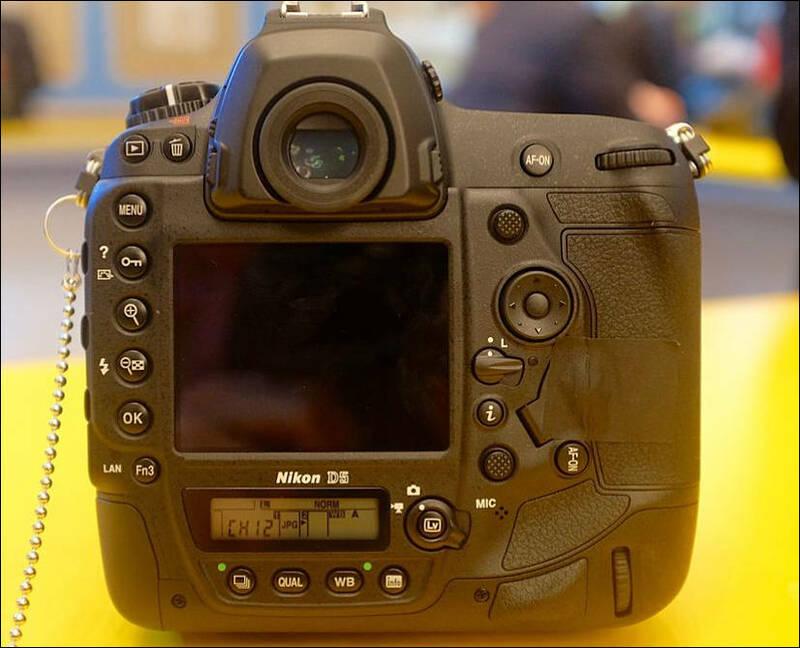 Multimedia Powerhouse with 4K/UHD Video - The Nikon D5 is the first Nikon DSLR capable of capturing 4K UHD video (3840x2160 at 30p), letting users create stunning ultra-high definition video with beautiful clarity and color. Multimedia content creators can also use the D5 to create 4K time-lapse videos in-camera using the Time-lapse Movie function, and can create 8-megapixel still images from frame grabs. 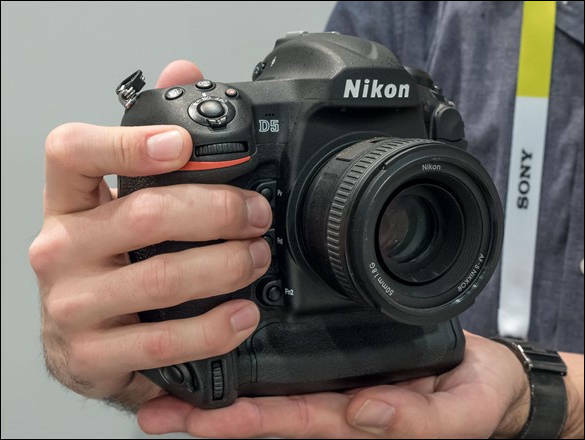 A great addition to any production environment, the D5 includes all of the most popular pro-level features of the Nikon D810, including Full HD 1080p video at a variety of frame rates, uncompressed HDMI out, simultaneous live view and headphone/microphone connections. 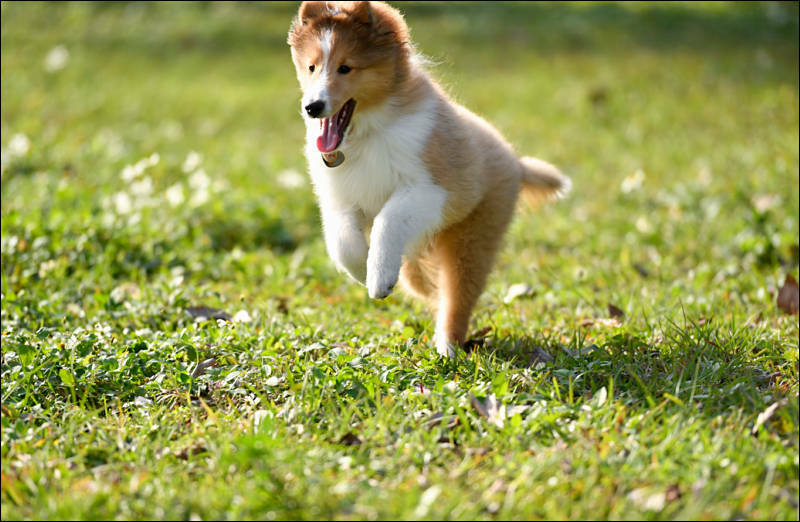 Additionally, the D5 adds a feature to smooth exposure transitions using the Auto ISO function as well as exposure compensation to create natural-looking exposure transitions in video. 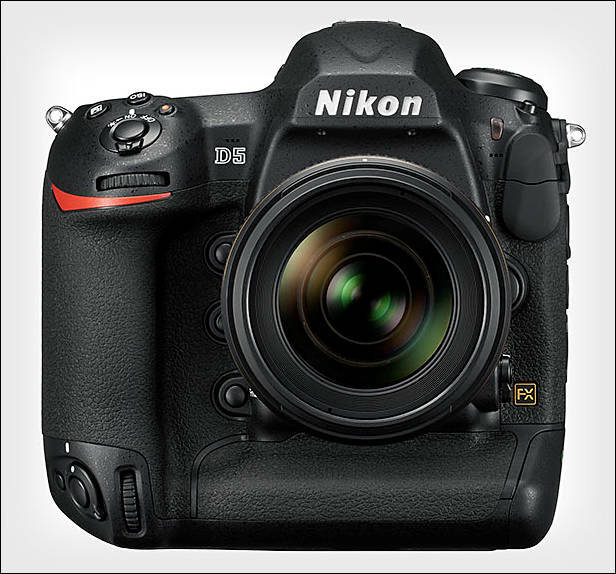 The Nikon D5 DSLR will be available in March for a suggested retail price (SRP) of $6,499.95. 4K recording limit of 3 minutes?! May be it happens due to lack of spanning. I also love 30 min limit for such priced bodies. Love to know though process in the managers heads. Seriously? 3 minutes? WTF??? I keep thinking Nikon will step up, but alas, they never do! Sheesh! I do have a D7100 I use for stills, and it's a decent tool in that regard, but I'd NEVER use a Nikon camera for video in the crippled state they offer it. Much better off with a Sony or Panasonic GH4. What's next from Nikon? A return trip back to APS film based on the fact that vinyl LPs are making a comeback?? They seriously underestimate the importance of offering quality HD and 4K video to their customer base in their products and are incurring opportunity costs they don't even perceive! We’ll wait and see what Nikon's other 2016 cameras have in store for video but I’m just not really sure they are in the position to offer anything unique over what we have already from Sony and Panasonic. Nikon must get real and start doing their research properly, first and foremost by asking the right people and not just those who only ever agree in order to sweeten their relationship with the manufacturer, or put their names to workshops and sponsored shooting opportunities. These people will never give bluntly honest feedback or shout Nikon down when they have made a mistake. Only independent filmmakers and the enthusiast video community will judge the situation in the cold harsh light of day. Think he didn't get a camera to review? Nikon will release a firmware update after shipping starts in March that will increase the 4k recording limit of the D5 to 30 minutes. 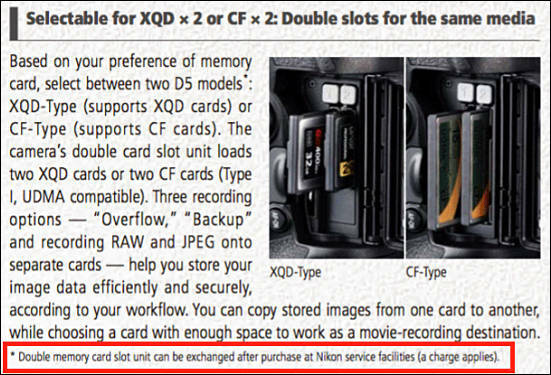 This info is coming from a Nikon rep. There was a Nikon at Hunt's Photo & Video in Massachusetts and I decided to attend. I didn't bother to get any shots of the presentation but I did get some quick shots of the cameras. The cameras were fully functional but they didn't want anyone to put a memory card in them to prevent people from putting it online since these aren't production units.